The Israelites initially worshipped Yahweh alongside a variety of Canaanite gods and goddesses, including El, Asherah and Baal. In the period of the Judges and the first half of the monarchy, El and Yahweh became conflated in a process of religious syncretism. As a result, ’el (Hebrew: אל) became a generic term meaning "god", as opposed to the name of a worshipped deity, and epithets such as El Shaddai came to be applied to Yahweh alone, diminishing the worship of El and strengthening the position of Yahweh. Features of Baal, El, and Asherah were absorbed into the Yahweh religion, Asherah possibly becoming embodied in the feminine aspects of the Shekinah or divine presence, and Baal's nature as a storm and weather god becoming assimilated into Yahweh's own identification with the storm. 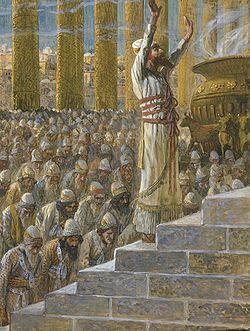 In the next stage the Yahweh religion separated itself from its Canaanite heritage, first by rejecting Baal-worship in the 9th century, then through the 8th to 6th centuries with prophetic condemnation of Baal, the asherim, sun-worship, worship on the "high places", practices pertaining to the dead, and other matters. Iron Age Yahweh was the national god of the kingdoms of Israel and Judah, and appears to have been worshipped only in these two kingdoms; this was unusual in the Ancient Near East but not unknown—the god Ashur, for example, was worshipped only by the Assyrians. 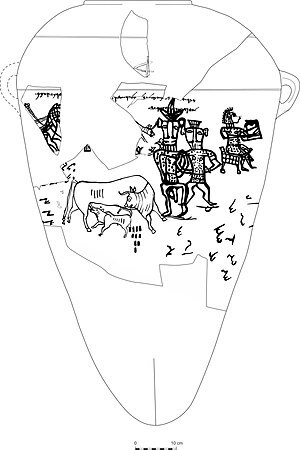 Image on a pithos sherd found at Kuntillet Ajrud below the inscription "Yahweh and his Asherah". The two standing figures are sometimes seen as a representation of the divine couple, while the seated lyre-player behind them is an entertainer. Alternatively, many art historians identify the standing figures as representations of the Egyptian dwarf-god Bes, on account of their distinctively bovine faces. 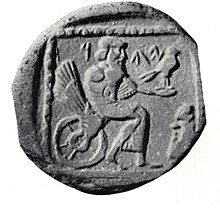 Ziony Zevit has argued that Yahweh was represented as a Bes-figure, though there is little evidence for this. It is also possible that the images on the pot have nothing to do with the inscription at all. Pre-exilic Israel, like its neighbours, was polytheistic, and Israelite monotheism was the result of unique historical circumstances. The original god of Israel was El, as the name demonstrates—its probable meaning is "may El rule" or some other sentence-form involving the name of El. In the early tribal period, each tribe would have had its own patron god; when kingship emerged, the state promoted Yahweh as the national god of Israel, supreme over the other gods, and gradually Yahweh absorbed all the positive traits of the other gods and goddesses. Yahweh and El merged at religious centres such as Shechem, Shiloh and Jerusalem, with El's name becoming a generic term for "god" and Yahweh, the national god, appropriating many of the older supreme god's titles such as El Shaddai (Almighty) and Elyon (Most High). Asherah, formerly the wife of El, was worshipped as Yahweh's consort or mother; potsherds discovered at Khirbet el-Kôm and Kuntillet Ajrûd make reference to "Yahweh and his Asherah", and various biblical passages indicate that her statues were kept in his temples in Jerusalem, Bethel, and Samaria. Yahweh may also have appropriated Anat, the wife of Baal, as his consort, as Anat-Yahu ("Anat of Yahu," i.e., Yahweh) is mentioned in 5th century BCE records from the Jewish colony at Elephantine in Egypt. A goddess called the Queen of Heaven was also worshipped, probably a fusion of Astarte and the Mesopotamian goddess Ishtar, possibly a title of Asherah. Worship of Baal and Yahweh coexisted in the early period of Israel's history, but they were considered irreconcilable after the 9th century BCE, following the efforts of King Ahab and his queen Jezebel to elevate Baal to the status of national god, although the cult of Baal did continue for some time. The worship of Yahweh alone began at the earliest with Elijah in the 9th century BCE, but more likely with the prophet Hosea in the 8th; even then it remained the concern of a small party before gaining ascendancy in the exilic and early post-exilic period. The early supporters of this faction are widely regarded as being monolatrists rather than true monotheists; they did not believe that Yahweh was the only god in existence, but instead believed that he was the only god the people of Israel should worship. Finally, in the national crisis of the exile, the followers of Yahweh went a step further and outright denied that the other deities aside from Yahweh even existed, thus marking the transition from monolatrism to true monotheism. In 539 BCE Babylon itself fell to the Persian conqueror Cyrus, and in 538 BCE the exiles were permitted to return to Yehud medinata, as the Persian province of Judah was known. 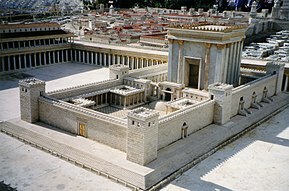 The Temple is commonly said to have been rebuilt in the period 520–515 BCE, but it seems probable that this is an artificial date chosen so that 70 years could be said to have passed between the destruction and the rebuilding, fulfilling a prophecy of Jeremiah. In recent decades, it has become increasingly common among scholars to assume that much of the Hebrew bible was assembled, revised and edited in the 5th century BCE to reflect the realities and challenges of the Persian era. The returnees had a particular interest in the history of Israel: the written Torah (the books of Genesis, Exodus, Leviticus, Numbers and Deuteronomy), for example, may have existed in various forms during the Monarchy (the period of the kingdoms of Israel and Judah), but it was in the Second Temple that it was edited and revised into something like its current form, and the Chronicles, a new history written at this time, reflects the concerns of the Persian Yehud in its almost-exclusive focus on Judah and the Temple. Prophetic works were also of particular interest to the Persian-era authors, with some works being composed at this time (the last ten chapters of Isaiah and the books of Haggai, Zechariah, Malachi and perhaps Joel) and the older prophets edited and reinterpreted. The corpus of Wisdom books saw the composition of Job, parts of Proverbs, and possibly Ecclesiastes, while the book of Psalms was possibly given its modern shape and division into five parts at this time (although the collection continued to be revised and expanded well into Hellenistic and even Roman times). During the Second Temple period, speaking the name of Yahweh in public became regarded as taboo. When reading from the scriptures, Jews began to substitute the divine name with the word adonai (אֲדֹנָי‬), meaning "Lord". The High Priest was permitted to speak the name once in the Temple during the Day of Atonement, but at no other time and in no other place. During the Hellenistic period, the scriptures were translated into Greek by the Jews of the Egyptian diaspora. Greek translations of the Hebrew scriptures render both the tetragrammaton and adonai as kyrios (κύριος), meaning "the Lord". After the Temple was destroyed in 70 CE, the original pronunciation of the tetragrammaton was forgotten. The period of Persian rule saw the development of expectation in a future human king who would rule purified Israel as Yahweh's representative at the end of time–that is, a messiah. The first to mention this were Haggai and Zechariah, both prophets of the early Persian period. They saw the messiah in Zerubbabel, a descendant of the House of David who seemed, briefly, to be about to re-establish the ancient royal line, or in Zerubbabel and the first High Priest, Joshua (Zechariah writes of two messiahs, one royal and the other priestly). These early hopes were dashed (Zerubabbel disappeared from the historical record, although the High Priests continued to be descended from Joshua), and thereafter there are merely general references to a Messiah of (meaning descended from) David. From these ideas, Christianity, Rabbinic Judaism, and Islam would later emerge. Yahweh is frequently invoked in Graeco-Roman magical texts dating from the second century BCE to the fifth century CE, most notably in the Greek Magical Papyri, under the names Iao, Adonai, Sabaoth, and Eloai. In these texts, he is often mentioned alongside traditional Graeco-Roman deities and also Egyptian deities. The archangels Michael, Gabriel, Raphael, and Ouriel and Jewish cultural heroes such as Abraham, Jacob, and Moses are also invoked frequently as well. The frequent occurrence of Yahweh's name is probably due to Greek and Roman folk magicians seeking to make their spells more powerful through the invocation of a prestigious foreign deity. ^ For the varying texts of this verse, see Smith, 2010, pp.139–140 and also chapter 4. ^ Van Der Toorn 1999, p. 766. ^ Edelman 1995, p. 190. ^ Smith 2010, p. 96-98. ^ Miller 2000, p. 1. ^ Dijkstra 2001, p. 92. ^ Dever 2003b, p. 128. ^ Hackett 2001, pp. 158–59. ^ Smith 2002, p. 72. ^ Wyatt 2010, pp. 69–70. ^ a b c d Betz 2000, p. 917. ^ a b Kaiser 2017, p. unpaginated. ^ Hoffman 2004, p. 326. ^ Parke-Taylor 1975, p. 51"The view adopted by this study is as follows. The ehyeh aser ehyeh clause in Exodus 3:14 is a relatively late attempt to explain the divine name by appeal to the root hayah the verb "to be."" ^ Day 2002, p. 15. ^ Dever 2003b, p. 125. ^ Miller 2000, p. 2. ^ Day 2002, p. 13-14. ^ Freedman, O'Connor & Ringgren 1986, p. 520. ^ Anderson 2015, p. 510. ^ Grabbe 2007, p. 151. ^ Dicou 1994, pp. 167–81, 177. ^ Anderson 2015, p. 101. ^ Grabbe 2007, p. 153. ^ a b Van der Toorn 1999, p. 912. ^ Van der Toorn 1999, pp. 912–13. ^ Van der Toorn 1999, pp. 912–913. ^ Van der Toorn 1995, pp. 247–48. ^ Noll 2001, p. 124–126. ^ Cook 2004, p. 7. ^ a b c Coogan & Smith 2012, p. 8. ^ a b Smith 2002, p. 32. ^ Smith 2002, p. 33. ^ a b Hess 2007, p. 103. ^ Coogan & Smith 2012, p. 7–8. ^ Handy 1994, p. 101. ^ Smith 2002, p. 7. ^ Smith 2002, p. 8. ^ Smith 2002, p. 33-34. ^ Smith 2002, p. 8,135. ^ Smith 2002, p. 9. ^ Hackett 2001, p. 158–159. ^ Hackett 2001, p. 160. ^ Grabbe 2010, p. 184. ^ Noll 2001, p. 251. ^ Schniedewind 2013, p. 93. ^ Smith 2010, p. 119. ^ Hackett 2001, p. 156. ^ a b c Davies 2010, p. 112. ^ Miller 2000, p. 90. ^ Petersen 1998, p. 23. ^ a b Albertz 1994, p. 89. ^ Gorman 2000, p. 458. ^ Davies & Rogerson 2005, pp. 151–52. ^ Gnuse 1997, p. 118. ^ Davies & Rogerson 2005, pp. 158–65. ^ Cohen 1999, p. 302. ^ Dever 2003a, p. 388. ^ Bennett 2002, p. 83. ^ Mettinger 2006, pp. 288–90. ^ MacDonald 2007, pp. 21, 26–27. ^ Vriezen & van der Woude 2005, p. 18. ^ a b c d Hess 2012, p. 472. ^ a b Albertz 1994, p. 61. ^ Gnuse 1997, p. 214. ^ Romer 2014, p. unpaginated. ^ Smith 2001, p. 140. ^ Smith 2002, pp. 33, 47. ^ Barker 2012, pp. 80–86. ^ Vriezen & van der Woude 2005, pp. 17–18. ^ Barker 2012, p. 32. ^ a b Ackerman 2003, p. 395. ^ Barker 2012, pp. 154–157. ^ Day 2002, p. 143. ^ Barker 2012, p. 41. ^ Smith 2002, p. 74. ^ Eakin 1971, pp. 70 and 263. ^ McKenzie 1990, p. 1287. ^ Davies & Rogerson 2005, p. 89. ^ Berquist 2007, p. 3–4. ^ Grabbe 2010, p. 40–42. ^ Leech 2002, pp. 59–60. ^ a b c d Leech 2002, p. 60. ^ Albertz 2003, p. 130. ^ a b Smith & Cohen 1996b, pp. 242–56. ^ Smith & Cohen 1996b, pp. 242–256. Ahlström, Gösta Werner (1991). "The Role of Archaeological and Literary Remains in Reconstructing Israel's History". In Edelman, Diana Vikander. The Fabric of History: Text, Artifact and Israel's Past. A&C Black. ISBN 9780567491107. Becking, Bob (2001). "The Gods in Whom They Trusted". In Becking, Bob. Only One God? : Monotheism in Ancient Israel and the Veneration of the Goddess Asherah. A&C Black. ISBN 9780567232120. Betz, Arnold Gottfried (2000). "Monotheism". In Freedman, David Noel; Myer, Allen C. Eerdmans Dictionary of the Bible. Eerdmans. ISBN 978-9053565032. Betz, Hans Dieter (1996). The Greek Magical Papyri in Translation Including the Demonic Spells (2 ed.). Chicago, Illinois: University of Chicago Press. ISBN 978-0226044477. Cohen, Shaye J.D. (1999). "The Temple and the Synagogue". In Finkelstein, Louis; Davies, W. D.; Horbury, William. The Cambridge History of Judaism: Volume 3, The Early Roman Period. Cambridge University Press. ISBN 9780521243773. Coogan, Michael David; Brettler, Marc Zvi; Newsom, Carol Ann (2007). "Editors' Introduction". In Coogan, Michael David; Brettler, Marc Zvi; Newsom, Carol Ann. The New Oxford Annotated Bible with the Apocryphal/Deuterocanonical Books. Oxford University Press. ISBN 9780195288803. Davies, Philip R. (2010). "Urban Religion and Rural Religion". In Stavrakopoulou, Francesca; Barton, John. Religious Diversity in Ancient Israel and Judah. Continuum International Publishing Group. ISBN 9780567032164. Dijkstra, Meindert (2001). "El the God of Israel-Israel the People of YHWH: On the Origins of Ancient Israelite Yahwism". In Becking, Bob; Dijkstra, Meindert; Korpel, Marjo C.A. ; et al. Only One God? : Monotheism in Ancient Israel and the Veneration of the Goddess Asherah. A&C Black. ISBN 9781841271996. Edelman, Diana V. (1995). "Tracking Observance of the Aniconic Tradition". In Edelman, Diana Vikander. The Triumph of Elohim: From Yahwisms to Judaisms. Peeters Publishers. ISBN 978-9053565032. Elior, Rachel (2006). "Early Forms of Jewish Mysticism". In Katz, Steven T. The Cambridge History of Judaism: The Late Roman-Rabbinic Period. Cambridge University Press. ISBN 9780521772488. Freedman, D.N. ; O'Connor, M.P. ; Ringgren, H. (1986). "YHWH". In Botterweck, G.J. ; Ringgren, H. Theological Dictionary of the Old Testament. 5. Eerdmans. ISBN 9780802823298. Gnuse, Robert (1999). "The Emergence of Monotheism in Ancient Israel: A Survey of Recent Scholarship". Religion. 29 (4): 315–36. doi:10.1006/reli.1999.0198. Humphries, W. Lee (1990). "God, Names of". In Mills, Watson E.; Bullard, Roger Aubrey. Mercer Dictionary of the Bible. Mercer University Press. ISBN 9780865543737. Mafico, Temba L.J. (1992). "The Divine Name Yahweh Alohim from an African Perspective". In Segovia, Fernando F.; Tolbert, Mary Ann. Reading from this Place: Social Location and Biblical Interpretation in Global Perspective. 2. Fortress Press. ISBN 9781451407884. Mastin, B.A. (2005). "Yahweh's Asherah, Inclusive Monotheism and the Question of Dating". In Day, John. In Search of Pre-Exilic Israel. Bloomsbury. ISBN 9780567245540. Mettinger, Tryggve N.D. (2006). "A Conversation With My Critics: Cultic Image or Aniconism in the First Temple?". In Amit, Yaira; Naʼaman, Nadav. Essays on Ancient Israel in Its Near Eastern Context. Eisenbrauns. ISBN 9781575061283. MacDonald, Nathan (2007). "Aniconism in the Old Testament". In Gordon, R.P. The God of Israel. Cambridge University Press. ISBN 9780521873659. Niehr, Herbert (1995). "The Rise of YHWH in Judahite and Israelite Religion". In Edelman, Diana Vikander. The Triumph of Elohim: From Yahwisms to Judaisms. Peeters Publishers. ISBN 978-9053565032. Smith, Mark S. (2000). "El". In Freedman, David Noel; Myer, Allen C. Eerdmans Dictionary of the Bible. Eerdmans. ISBN 9789053565032. Smith, Mark S. (2002). The Early History of God: Yahweh and the Other Deities in Ancient Israel (2nd ed.). Eerdmans. ISBN 9780802839725. Smith, Mark S. (2003). "Astral Religion and the Divinity". In Noegel, Scott; Walker, Joel. Prayer, Magic, and the Stars in the Ancient and Late Antique World. Penn State Press. ISBN 978-0271046006. Smith, Morton (1984). "Jewish Religious Life in the Persian Period". In Finkelstein, Louis. The Cambridge History of Judaism: Volume 1, Introduction: The Persian Period. Cambridge University Press. ISBN 9780521218801. Smith, Morton; Cohen, Shaye J.D. (1996b). Studies in the Cult of Yahweh: Volume Two: New Testament, Christianity, and Magic. Leiden, The Netherlands, New York City, New York, and Cologne, Germany: E. J. Brill. pp. 242–56. ISBN 978-90-04-10479-2. Sommer, Benjamin D. (2011). "God, names of". In Berlin, Adele; Grossman, Maxine L. The Oxford Dictionary of the Jewish Religion. Oxford University Press. ISBN 9780199730049. Van der Toorn, Karel (1995). "Ritual Resistance and Self-Assertion". In Platvoet, Jan. G.; Van der Toorn, Karel. Pluralism and Identity: Studies in Ritual Behaviour. BRILL. ISBN 978-9004103733. Van der Toorn, Karel (1999). "Yahweh". In Van der Toorn, Karel; Becking, Bob; Van der Horst, Pieter Willem. Dictionary of Deities and Demons in the Bible. Eerdmans. ISBN 9780802824912.